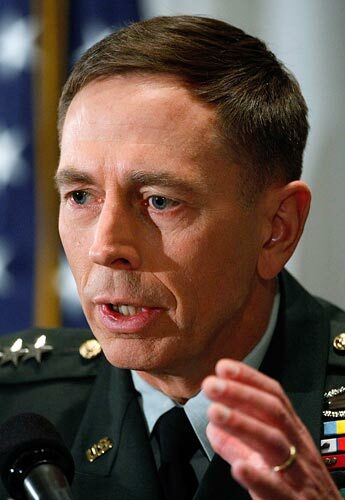 Petraeus: U.S. Must 'Do the Math' on Iraq Troops Gen. David Petraeus says U.S. troop levels in Iraq should be further reduced after mid-2008, when they are expected to return to pre-"surge" levels of about 130,000. But he tells NPR that U.S. commanders are still assessing how deep the cuts should be. 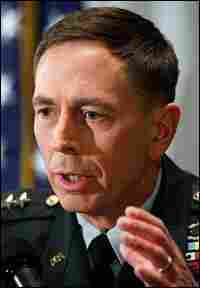 Gen. David Petraeus answers a reporter's question during a news conference at the National Press Club in Washington, Sept. 12, 2007. Gen. David Petraeus says U.S. military commanders are still assessing what the right levels of U.S. troops in Iraq should be after mid-2008, but that further reductions will be needed. In an interview with NPR's Steve Inskeep, Petraeus says that the U.S. military buildup in Iraq, which President Bush ordered in January, has resulted in "true change" in some areas of the country – most notably, in Anbar province. "That change is a case of tribal leaders going from at least turning a blind eye to al-Qaida, perhaps, to supporting al-Qaida in Iraq in the Euphrates River valley, to opposing them," Petraeus said. The top American military commander in Iraq, Petraeus has spent the past week in Washington, D.C., trying to persuade Congress – and the American public – that the troop increase in Iraq is working. At the same, Petraeus acknowledges that the so-called troop "surge" has placed an "enormous strain" on U.S. combat forces. He says troop levels will have to be further reduced after mid-2008, when they are expected to return to pre-"surge" levels of about 130,000. How much further? Military commanders still have to "do the math," he says. GEN. PETRAEUS: In many respects, this is a thinking man's warfare. You can't kill everyone out there. You're not going to kill yourself out of an insurgency. INSKEEP: Are you convinced that the increase in U.S. troops is, in fact, responsible for the decrease in violence? No one left to kill, so there's less violence. On the other hand, there will continue to be — at every ethno-sectarian fault line – violence, if [Iraq] is not stabilized, and if you cannot reach a sustainable situation, really, through a result of both politics and security activities. This leads to another question. If you feel that the extra troops have in fact played a significant role in bringing down the violence, do you believe that something fundamental or permanent has changed that would keep the violence anywhere near in check once you take those troops away? You don't think that's a marriage of convenience? That they're working with you now because it helps them tactically now, and they might see their interest a different way under different circumstances? Well, they actually want their share of the resources. And remember, all the resources flow through the central government. There is no local revenue-generation in Iraq. And that is the mechanism, actually, that the prime minister and the government have used to mitigate the risk, in fact, of these individuals turning their weapons against someone else. Has something permanent changed in Baghdad, where some of the worst violence had been, and where there has been at least a temporary decrease? In some areas. 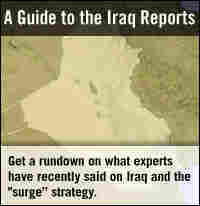 There are still tough areas in Baghdad, and if you look at the slide [in Petraeus' PowerPoint Presentation to Congress] that showed the reduction of ethno-sectarian deaths in Baghdad, first, you see that there are still significant numbers of deaths each month, and second, you see where the hot spots are, literally. You know, it would seem, as you look at a PowerPoint slide, that perhaps you say, 'Ah, there it is; well, let's do something about it.' Well, where it is may represent tens or hundreds of thousands of people, and it takes an enormous amount of resources to deal with that. So you mass the resources in those areas to figure out what the sustainable solution in those areas can be. Well, we have to do the math, candidly. We've got – I have not yet said how many thousands of troops. So when people have said 30,000, they're not quite accurate. It might be 30,000 — it might be quite a bit less. Well, we've got to determine what it can be. The mission so far, in a sense, was to figure out how to bring these down while sustaining the gains that our troopers and Iraqi troopers have achieved, and also, then, to figure out the larger picture of where else can you reduce forces — which is something we want to do anyway. Is there a basic reality having to do with the number of forces available that is going to force you to reduce the size of the commitment in Iraq by the middle of 2008, now matter what the strategic imperatives might be? Well, we clearly have enormous strain on the Army and the Marine Corps. And as I explained to Congress and to my chain of command, an important factor in among the considerations of the reduction of the surge forces, as opposed to recommending some additional forces after that or what-have-you, was the strain and the stress. And so we've looked very, very hard at that. You know, I personally have been engaged in this for some time now and am pretty keenly aware of the sacrifices that we have asked of not just our troopers, but also of their families. Which raises another question: Is there a basic reality having to do with the availability of forces that is going to compel further reductions after mid-2008, no matter what the strategic imperatives might be? That's a question, really, for the so-called force providers, if you will — for the Army and the Marine Corps. My understanding is that they can sustain that. But again, as I told Congress, we have every intention of drawing down further. And as I also explained, I just am not at all comfortable with trying to lay that out at this point, almost a year away from that time. And you know, you've seen just in the past six or seven months real surprises, frankly, in Iraq, as we've seen along the way. I want to make sure I'm clear on this point, because there are analysts who would say something differently. Are you saying that if you ask for 130,000 troops for a couple of more years, and if your boss approved, if that was the need, that you're confident that the U.S. military, as currently sized, could provide that many troops? You would not be forced into a reduction? What I would say is, I don't know. Again, I just have not asked that question, and again, it's a long time from making recommendations about what level of forces we need. I believe that to get to certain dwell times, we're going to have to come down farther. This transcript includes minor edits for clarity.